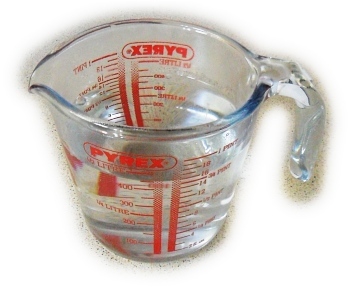 Use a heat-resistant jug for this because you are going to be pouring boiling water and cold water into it - something that would destroy anything that wasn't heat resistant. 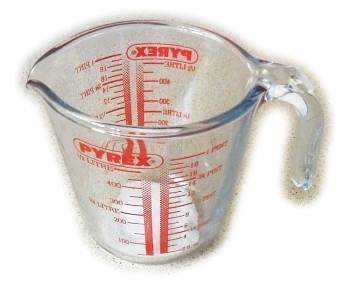 Here, I'm using a 1pint Pyrex glass jug but a plastic jug will do just as well, if not better - see further down this page for why. Add the sugar - this is just food for the yeast. 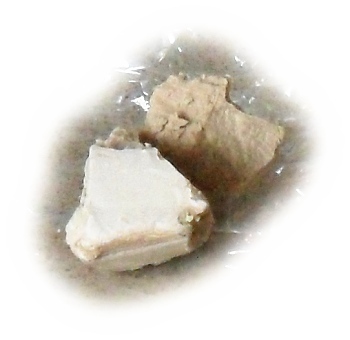 You can use any sugar you like, it doesn't really matter which type - you can use jaggery or Chinese sugar if you want - but if you are adding yeast to something with a delicate flavour then use white sugar. Dissolve instantly in 100mls boiling water. The sugar will dissolve really well in boiling water but hot water will kill the yeast, so here, we are going to take advantage of the situation. We are going to make roughly 300mls of yeast suspension and we need it to be around 35C. 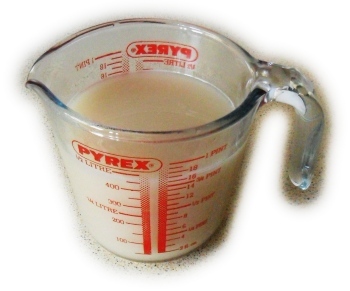 We have cold water and boiling water so, if we mix roughly one part of boiling water with two parts of cold water, we will end up with something that is roughly right - keep the proportions when scaling this up or down. Add 100mls of boiling water, straight from the kettle and stir the sugar until it dissolves - this is fairly quick, around 10 seconds. 35C with 200mls of cold water. Now add twice as much cold water as you had boiling water so in this case, add 200mls of cold water and give it a quick stirr, just to mix it up. 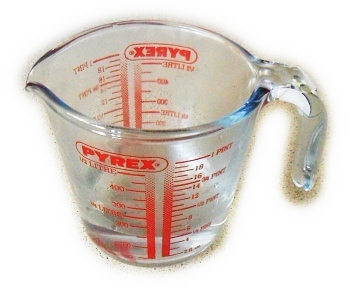 If you were wondering about the proportions of water and their temperatures, the temperature multiplied by the mass, for the same liquid should be the same. The point where error creeps in is that the jug we are using also holds heat. If you have not much water and a large, heavy jug then the heat from the boiling water will be absorbed by that instead of going to make the cold water warm. With that in mind and the typical scale of things that happen in kitchens for domestic food preparation such as this, the minimum I would prepare is 300mls, ie 100mls of boiling water. If less is needed, then just tip the surplus away. Don't keep it, always used fresh yeast. Real yeast - you can use dried if you can't get this. This is the yeast. It isn't dry but it does crumble if you apply a bit of force to it. You can get it from the supermarkets that make their own bread, on-site. They will (or should) be more than happy for the odd domestic user to have a bit of spare live yeast - after all, it does get you in the shop, buying other things as well, instead of going off to a different supermarket that will supply you with yeast. If you really can't get hold of this stuff then dried yeast will do as a direct substitute instead - just use a little less (it has less water in it) and give it a bit longer to get going (it isn't just having a snooze like the live yeast, it is positively dormant). water, cover and leave it. Into the lovely, sweet water that is around blood temperature, add the yeast and mix it in well. 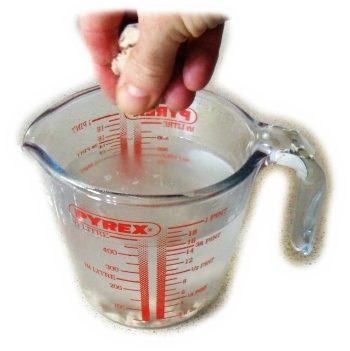 If you are using live yeast, you will have to stir it and squish it against the side with a spoon until it is all dispersed. If you are using dried yeast granules, tip them in a give them a stir, and then again a few seconds later, and so on, until they have dispersed. Finally, cover the yeast suspension with a dry tea towel and put it somewhere warm for around 10-20 minutes. it just fizzes, like this one. it should have a 'head' of yeast foam on it. In the case of the latter, just stir that into the rest of the liquid before you use it. It doesn't matter which of the two it does, as long as it is producing gas and doing it quickly enough, it is ready to use. it just hasn't had long enough to get going. Dried yeast is often not as active as live yeast because the drying process tends to kill them off more. Live yeast could be a little older than is optimal and again, might not have enough live yeast in it. Also, you might not have added enough yeast in the first place. so just give it a bit longer.